In recent months, Microsoft has integrated many features into Skype. In order to ensure consistency, the instant messaging application has evolved enormously in recent times, whether it is the mobile or desktop version of the application. Microsoft's objective is to offer an identical experience to its users, regardless of the device used and the context (professional or leisure). Microsoft has been offering screen sharing functionality in Skype Mobile (Beta) since Thursday, April 11. The concept is simple: thanks to this option, the user can share his screen with his correspondent, whether it is a friend, a family member or a close friend. What use will you tell me? The applications are diverse, one can imagine the sharing of working documents between colleagues. This feature could also be used between relatives, to help a friend or family member to take control or install any application. As The Verge points out, with screen sharing, Mobile Skype is getting a little closer to competitors such as GoTo Meeting or Zoom. These applications, which were originally designed for a professional audience, already offer similar functions. Microsoft is betting here to bring it to individuals. We can already imagine the possible hijackings of the tool such as the live sharing of WhatsApp or other conversations. Microsoft also specifies that the application will record everything that appears on the screen. The company recommends activating the "Do not disturb" mode of your smartphone to prevent the appearance of unexpected notifications. 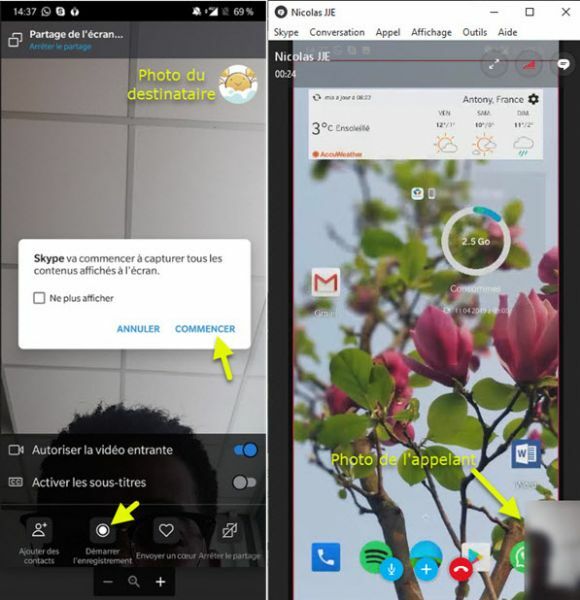 How do I enable screen sharing on Skype Mobile? For the moment, only the beta version (Skype Preview) 8.43.76.38 offers this feature. We tested the screen sharing on our Android smartphone. Make a video call with one of your contacts. Go to the three points at the bottom right to display the menu and start the screen sharing. If necessary, it should be noted that the recipient does not have the opportunity to interact with the content displayed. It can only switch to the image of the caller or that of his screen. Redmond has not yet specified when users of the final version of Skype will be able to enjoy screen sharing.